This week has involved yet again more time spent on aeroplanes - I'm back in the UK. First up I had a couple of nights in Wales spent with my family and friends. That has then been followed by a weekend with my man in London, in the sunshine. Yes, you read correctly, sunshine. Yesterday London basked in glorious sunshine. As we moved about this city I love, residents and visitors alike were enjoying the treat of some Great British sunshine. There are few big cities that are better enjoyed on a summer's day than London. The city's gorgeous parks were teeming with people, almost as busy as Oxford street. Our wedding just now around the corner. And as we close in on the big day I have had one very important mission - in fact, my primary mission for this week: my final dress fitting at Browns Bride followed by collection of my couture gown later today. My mum traveled to London from Wales on Tuesday morning to meet me and together we headed to the boutique for my fitting. The dress fitted like a dream. It's is made to measure though so kind of what you'd expect, right? The length needed a little alteration but apart from that there was nothing left for them to do (£500 flat fee for alterations - ridiculous). The length altered, I used the balance of my half hour slot to prance around the little boutique that is Browns, on cloud nine. So what's the dress like...? Well, I am not giving away too much. I can tell you the designer is Galia Lahav (check it out http://www.galialahav.com/). 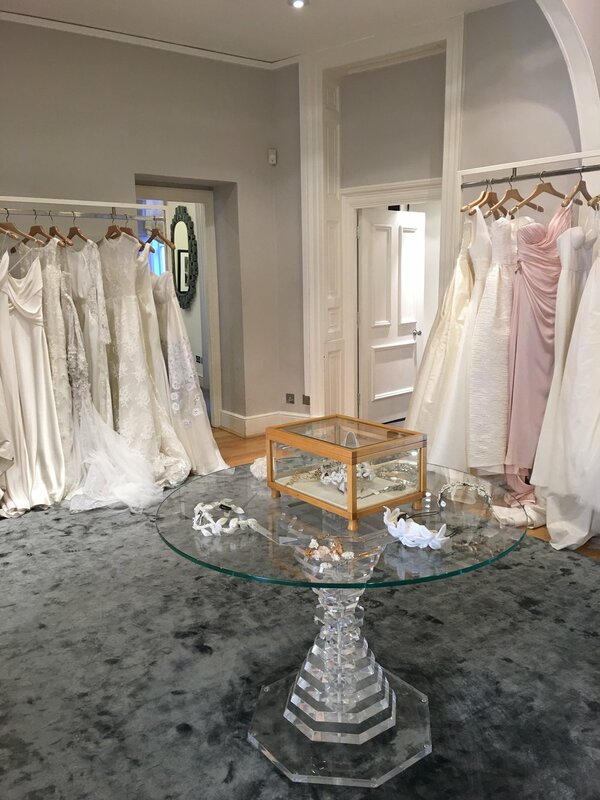 Back in January when I first chose my dress I decided to hit Browns Bride for the job since they have a wide, if not the widest range of dresses and designers available. From Monique Lhuillier to Vera Wang, and Maggie Sottero to Jenny Packham, they have them all. Presented with all of the options I immediately fell in love with Galia Lahav designs and one design in particular. From there it was one of those classic bridal stories. I tried on the first dress, followed by another 10 and then promptly went back to the very first one. I knew it was perfect but had that nagging doubt just because it was the first one I tried on. It couldn't possibly have been that simple. It's the most important dress purchase a girl makes so it has to be perfect. And when I saw the finished product earlier this week those doubts were immediately swept away. It is simply beautiful. So, today is finally the day. My gorgeous gown has been pressed and packed and is ready for collection. We will head back to the sand tomorrow with it to count down the days until I wear it for our big day in Italy next month. Keep following for more exclusive wedding pics. I'd also love to hear your wedding stories.